Back in my day we played "both ways." There was no such thing as an "Offensive team," "Defensive Team," or "Special Teams." That was football in the early '50's. We wore leather helmets and no face masks and since our equipment was paid for by taxes, it was consistent in disrepair. But one thing we did have: We had communion! The communion of which I speak is not the liturgical kind, which has its own wondrous and meaningful purpose. The kind of communion we're talking about here is a group of friends who care for each other, love each other, and interact with each other; a team that focuses on one objective -- communion with Jesus Christ, and bringing his love, his healing and his substantive help to others. Touchdowns (life changes) occur when that happens. 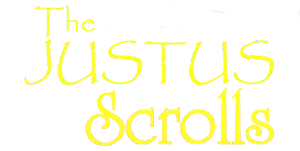 I would like to offer this place, THE JUSTUS SCROLLS website, as a place where this purpose is served. I think of it as a hub where spiritually-seeking people can communicate with one another, get to know one another and minister to one another. As you may have already discovered, there are dozens of online churches (maybe thousands) and only God knows how many people "attend" or interact with them. So it seems that interest would depend on what that spiritual community can do for you -- and what you can do for the community. After all, a communion is nothing more than a family of believers who wish to worship God and nourish each other. That's what we wish to do here. Make no mistake: YOU bring to this community what no one else can bring and what you bring is equally important, equally quantifiable and equally affirmed. If you believe in God or think you might want to believe in God, and if you wish to interact with others who are seeking the same thing, you have come to the right place. I thought you would never ask. As we have noted elsewhere on this website, Justus was effectively excluded from becoming one of the 12 apostles. The Bible does not give us a reason why, other than when they "cast lots," Matthias was chosen instead of Justus. Some might say that Justus was just unlucky. Others might conclude that something was wrong with him. But the man had just spent 3-4 years with Jesus and the disciples. Presumably, he was as intimate with Jesus as Matthias and likely the rest of the apostles as well. The Acts 1:21-26 passage is the only place where Justus is mentioned in the whole of scripture. Nothing negative is said about Justus here, only that Matthias was chosen. I prefer to think that God had other, at least equally significant, plans for Justus. And you know, I just couldn't help wondering how Justus felt about being excluded from this group of men. Very likely, he took it graciously and congratulated Matthias. But when he was off by himself, when he was alone with his thoughts, did he ask the question, "Is something really wrong with me? Does this mean that God has rejected me?" Since the Bible tells us nothing more about Justus; since he is never mentioned again in Acts or any of the epistles, maybe he just dropped off the cliff, and left the church. It happens. We are left to wonder. Traditional church history speculates that he became the bishop of Eleutheropolis -- an unlikely and implausable possibility. So we are left with a mystery, a mystery that has provoked a 582-page book. Don't get me wrong, the book is hard to put down, a truly great read. But the mystery here is not so much of a mystery to a whole generation of people in our day. Young people mostly. Or people who have found a certain quality of emptiness in what passes for churches today. Or, if not emptiness, exclusion. They just don't seem to fit. Somehow, their needs are falling short of being met, and we wonder not so much what is wrong with them, but what does God have for them? THE JUSTUS SCROLLS presents a robust Jesus with the same powerful teachings, sparring with the Pharisees, healing and raising people from the dead; he is the same Jesus who claimed to be God and proved it by all that he did and said. But he is not the iconoclized, propositionalized, theologized, emotionalized or industrialized Jesus we hear about every Sunday. He is the same Jesus whose purpose was to reveal a loving Father and to redeem us all in his death, burial and resurrection. So The Justus Communion is a group of people who do not feel quite comfortable enough in the organized church to be themselves, or to ask questions without getting canned answers. The Justus Communion is an online habitation for those who feel alienated from the church liturgy, or even the "church life." It is a center for intellectual freedom and safety. It is a dialogue in our search to find intimacy with God in the Person of his Son, Jesus. And you, dear friend, are invited to be a part of it. You will be able to interact with many friends here. You will be able to participate in sharing your ideas as well as expose yourself to the ideas of others. You will be able to hear and see (by videocam) Paul share the insights God has provided for all of us. All of that is on the table. The genius of this community is that it is not intended to exist merely on the Internet. You are encouraged to share what you learn here with any of your friends, neighbors and aquaintances you think would enjoy it. It is envisioned that you will gather in your homes and create your own Justus Communion for participitory worship. And once your group has grown to an unweildy size (5-8+ families), split it up and meet in two homes, and God himself only knows how far this will go. The Internet website serves as a basis for study curricula, hosted by the author; dialogue with the author, coordination of activities, scheduling of events, and provision of counseling and guidance as requested. All that is necessary for the moment is simply to register your interest.